'Roma,” a masterful drama by Alfonso Cuarón, is many things at once: epic and intimate, mythic and mundane. Based on Cuarón's memories of growing up in a bourgeois Mexico City household in the 1970s, this tone-poem to his youth is shot through with vivid sensory cues that pulse with equal parts delight, sensuality and sadness. 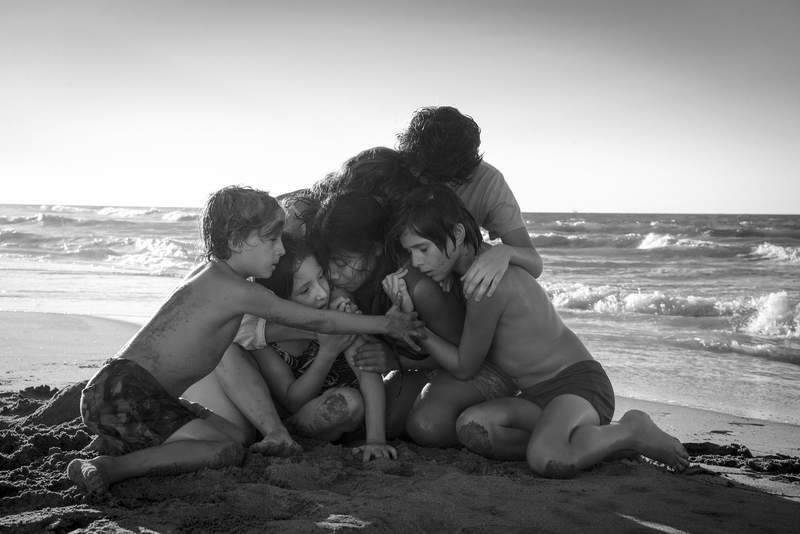 Shot by Cuarón himself in widescreen black-and-white – a format that lends monumentality and permanence to the quotidian, evanescent events depicted here – “Roma” achieves the rare feat of making the personal authentically political, not through explicit polemic or tortured metaphors, but simply by observing life with enough perspective to reflect it in all its contradictions. And reflection is the operative term in “Roma,” which takes its title from the middle-class neighborhood where Cuarón grew up. Early in the film, the entire screen is taken up with a pailful of sudsy water as it sluices over a courtyard floor, its slick surface at one point capturing a balcony and a plane flying overhead. The person mopping the floor is Cleo (Yalitza Aparicio), who works in the household of Sofía and Antonio (Marina de Tavira and Fernando Grediaga), cooking, cleaning and caring for their four children. The initial scenes of “Roma” silently follow Cleo through the labors of her day, gradually establishing the rhythms of life, not as it's so often dramatized or oversimplified, but as it is lived. What becomes clear is that, although Cleo and her fellow domestic staff members are subservient to their bosses, the relationship isn't limited to conventional “Upstairs Downstairs” dynamics of power and servitude: Cleo is clearly a member of a family that doesn't just depend on her physical work, but on her emotional labor as well, putting their relationship with her into territory that exists somewhere between exploitation and genuine affection. Cuarón, who based Cleo on his real-life nanny, might have thought twice about the pitfalls of a prosperous filmmaker making a tenderly nostalgic movie about the indigenous woman who nurtured him as a lad. On paper, the setup sounds unforgivably patronizing, the stuff either of cheap sentiment or clueless privilege. But “Roma” dodges those traps, building into something far more complex and emotionally shattering as Cuarón's discreet, gracefully swaying camera follows Cleo through an initially uneventful, finally tumultuous period in her life. One way that Cuarón avoids solipsism is to keep his own most consequential experiences to the story's margins – his parents' split is portrayed obliquely, through allusive moments and eavesdropped conversations. But the grievous impact of that event permeates the film, even as Cuarón's camera accompanies Cleo to the movies with her friends, or on a shopping trip or at a hunting party at an aristocratic hacienda. A master of constructing environments that convey volumes of essential information about the people who move through them, Cuarón here deploys exquisite visual and aural details to do the heavy lifting usually reserved for plot, dialogue and characterization. With “Roma,” one of our finest filmmakers has delved into an experience uniquely his own to create something that feels simultaneously sui generis and universal, deeply private and instantly recognizable. That describes a great work of art, and that's precisely what “Roma” is.